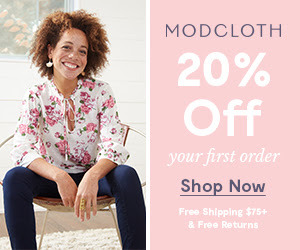 ModCloth.com is an e-retailer providing a vast selection of remarkable fashion and decor inspired by our community, and delivered with uncommonly awesome customer care. Our incredible community lends a hand in shaping the future of fashion by voting for what they want us to sell in Be the Buyer, designing pieces we’ll produce in Make the Cut, sharing endless outfit inspiration in the Style Gallery, and so much more. Preview the ModCloth lander here. Get paid 4% of sales for each sale made through your affiliate links.